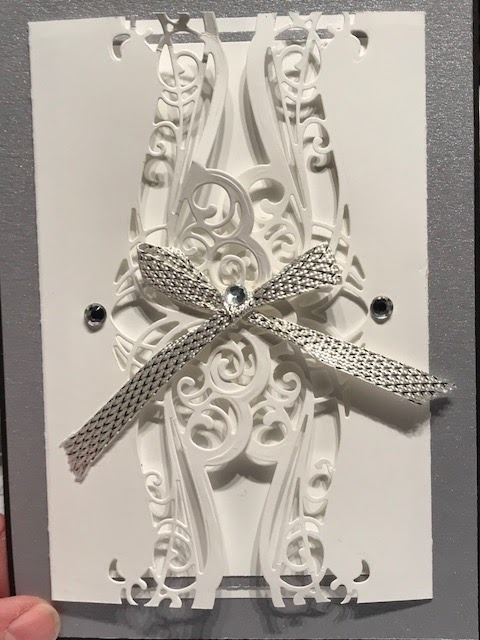 I've been working on a friend's wedding invitations and wanted to show you how they turned out. This gatefold design is so pretty and elegant, but I do have to say they do take some time to complete. In the end my friend (the bride) is very happy with them and they were fun to do. The invite inside the die-cut wrapping is removable. Here's of photo of just the gatefold wrap. The base and the sides have been die cut. The design uses three different die cutting sets. 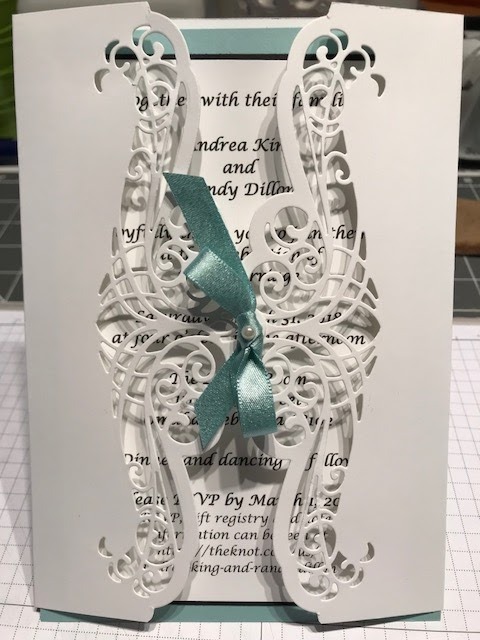 Below are the instructions including sizes of the finished invitation. 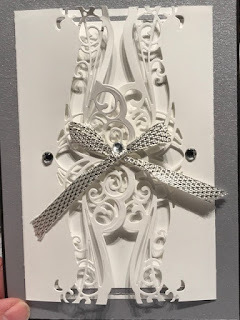 The finished invitation measures 5 x 7 and fits nicely into a standard sized envelope (don't need to special order envelopes this way). 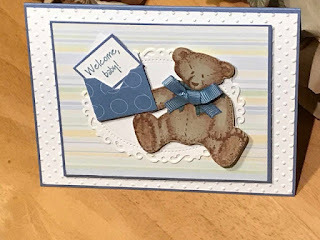 For the gatefold, use the background die on the white 5 x 7 piece and the border die on the 2 - 3 1/4 x 7 pieces. Once the side pieces have been die cut, score 1/4" on the straight edge and fold. Glue the fold edges to long sides of the base to make the gatefold. I used a Big Shot to die cut my pieces. 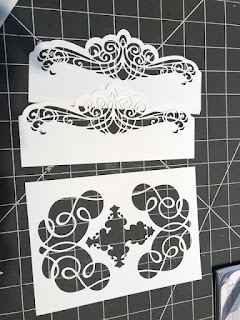 You could cut a piece that is 7 x 11 and use one of the larger die cutting machines. You would than score at 3" and 8". This is where the panels would fold. 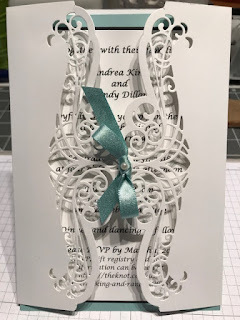 The invitation can be made by printing or handwriting the wedding day specifics on the remaining white cardstock piece. 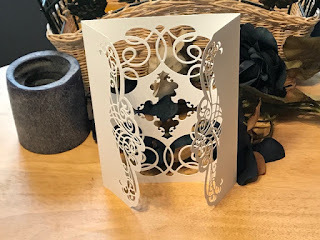 Glue the white piece to the black piece and center that on the colored cardstock piece. To add the extra touch of elegance, make a small bow and adhere to the front of the left panel. Place a half-back pearl in the center of the bow and you are done. Here's another example of the same style but the color in on the outside of the gatefold. This design could also be used for wedding and anniversary cards. Any special couple would love to get one of these cards.